If you are looking to retreat from the stresses of suburbia and to enjoy the simple pleasure of being in the country-side then this is the accommodation for you. A self-servicing luxury farm stay cottage offers peace and quiet, privacy, seclusion, tranquility. Set in rural landscape with views across farmland to the sea to the north and Mt Taranaki to the south. The sound of birds in the bush and of the creek nearby are the only things to interrupt the silence. Alpacas may seek your company at the window and then return to grazing with their herd. Just 10kms from New Plymouth, the many attractions Taranaki has to offer are close by, eg beaches, mountains, gardens, golf courses, Pukekura Park, Bowl of Brooklands, Pukeiti Gardens, Pukeariki Museum, Len Lye Art Gallery. Facilities include double bed accommodation for 3 couples (2 queen-size beds in each bedroom, and a foldout couch in the lounge) and there are roll-out beds in addition. Hot Spring Spa/Jaccuzi. Fully equipped kitchen and laundry. Gas heating. Entertainment facilities include Sky TV, ipod dock, Blue Ray player. Farm shop selling alpaca products from raw fleece through to processed yarn and knitted garments, duvets and rugs. Open on request. Bush and farm walks near the retreat. Usual farm hazards exist eg electric fences, water troughs, uneven ground, pond and waterways. Caution required. Outside spa on the deck - perfect! We have loved staying here and had planned on spending the day in New Plymouth but came back early to our cottage as we just wanted to enjoy the scenery and Alpacas. Absolutely amazing place with every detail thought of. Thank you so much to Nic for letting us feed the alpacas too! We will definitely be back and cant wait! the baby alpacas are so cute, and it is a lovely place to stay. the hosts are very responsive and awesome. 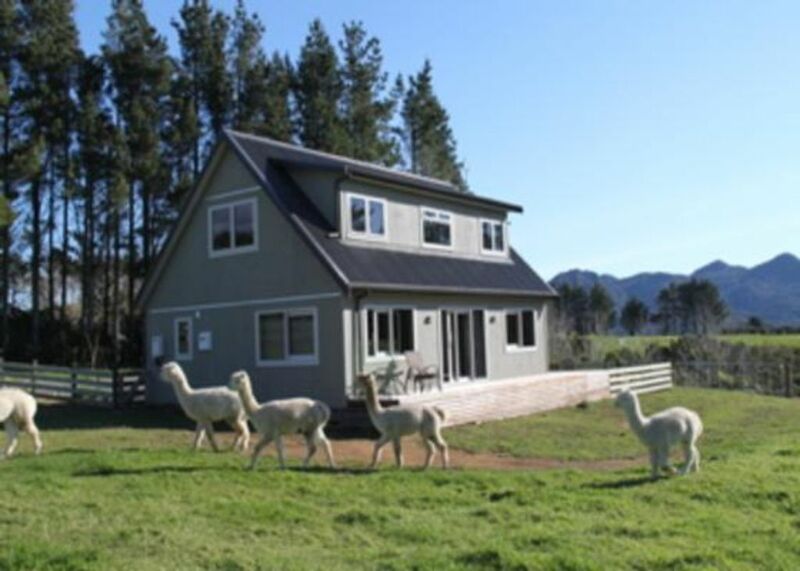 Lovely tranquil spot with Alpacas right on your doorstep. Brilliant accommodation. We were a party of 6 adults. Everyone loved the property. All saying they would stay here again. Clean, tidy and all the luxuries of home. Fantastic place will definitely be back.